The walk-in closet design project has been completed, using some of the leading EasyCloset.com products and accessories. The focus of our DIY project is on the installation of the customized closet shelving and related accessories and a painting job. Before we started the project, we appropriated $2,500 and were quite surprised to end the whole gig spending just $2,400. One of my hobbies is checking out DIY sites, and one of the sites that took my attention was EasyClosets.com. What captures my attention was the feature on the site that allows you to design your own custom closet, using their trademark software. I would like to share to you my experience in using and working with this site, and at the same time provide you my experiences in doing my own customized walk-in closet. One of the best things about the site is the availability of the software that lets you plan out and design your own customized closet. Sure, there are a number of sites with similar resources but I found the service of EasyClosets.com as one that is easier to use and understand. So when I decided to design my own walk-in closet, I was really surprised at the kind of help that I got. I was very much impressed with the use of the friendly graphical user interface that allows me to refine and change my selections. If there are some changes that will be made on the color of the wood and the types of drawers to be used, the site instantly allows me to do it. The problem with other sites is that the ordering process is complex and turtle-slow. The nice thing about working with the site is that you are given options on how to design the closet- you can either use the on-site software or you can always mail or fax them the specs and measurements that appeal to you. They can even provide feedbacks and recommendations as soon as they receive your plan. This is one thing that makes the site a league above the rest. The shipping is done the next day, and yes, shipping comes for free if the address is within continental US. I actually received a shipping confirmation from UPS and the tracking number. The shipments arrived after 2 days, with no obvious damages. The quality of packaging looked good and professional too. The true test of a product can be found in its application. 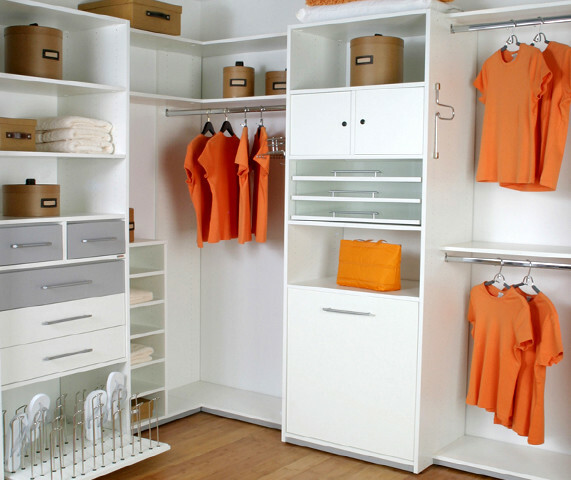 In the case of closet materials, its test can be found in the installation. The materials are easy to assemble and you don't need advanced skills in carpentry in order to start the project. There is a guide provided on how to assemble some of the parts, and this too is easy to read and follow. There are diagrams that can clarify the step-by-step process. I used only the most basic tools in the project, except for the table saw to rip the hutch cam shelf. Some of the other tools that I used in this project include the cordless drill, the 6' builder's level, the sliding miter saw, table saw, hacksaw, hammer and screw driver. The finished product is good. at some point, I was questioning the use of Melamine laminates but at the end of the day I was convinced of its durability. The look and feels of these materials were great, even though the materials are not made from solid wood. Also, I must state the all materials arrived without damages and yes these products are highly recommended to all. I must say that I am impressed with the products and services of the site, thus writing this review is relatively easy. So will I buy their products next time? Yes, you bet! This is one of the best sites online, and I hope EasyClosets.com will continue the good job!